Walking into the theatre, the first image you see normally provides some sense of the play you’re about to watch. This wasn’t the case with Ibala. The preset image for the show was two womxn dressed in helper’s uniforms in a corner, standing as though outside holding cardboard placards. The signs read: ‘Helpers, we are called, but our voices remain a meaningless song in the sidelines of these lives.’ And, ‘We live in the peripheries of the society. Our voices have become a song to what our eyes and ears have experienced’. The play begins and the two helpers exit the scene. It’s about a love triangle. The helpers are there for the first third of the play and then the location changes and they disappear for the rest of the production. It is not at all about them and the issues written on the placards. 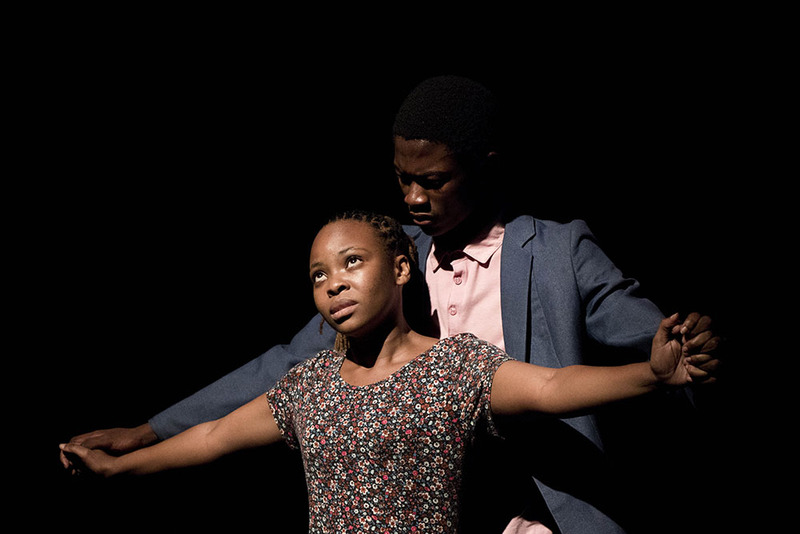 Ibala, written and directed by Busisiwe Mazibuko, who also performs in the play, is a wonderfully soppy piece of theatre. The piece follows a married lecturer whose wife is discovered to have been cheating on him for years. In his heartbreak, the man moves away and takes a guest lecturer position in the Eastern Cape. There he meets a womxn on whom he cheats until she discovers his infidelity and threatens to leave him. It is like a soap opera, but what is wonderful about its brand of overwrought drama is the fantastic performances delivered by the main actors; excluding the director herself, who had to step in when a cast member had to drop out because of exam pressure. The performances are so tender in their portrayal, so committed in their focus, and so detailed in their reactions to each moment of the hour and a half-long production that they are nothing short of inspiring. The characters are Thabo, the university lecturer, and Anelisa a recent graduate who meets the lost lecturer on his way into the city. The meeting is split between reality and Anelisa’s imagining of what the man she has met and immediately falls in love with would say in declaring his love toward her and marrying her. The meeting scene is a cleverly constructed gimmick in which the audience does not realise it is in Anelisa’s imagination. It is the stuff of the oohs and aahs of the most sentimental romantic movies. Ibala’s style becomes quite clear once the work is in full steam. A guitarist strums along to the moments of romance. He keeps purposeful silence at instances of tension. The womxn who played the helpers initially, when the play seemed to be making some sort of political commentary, become the singers to the background music that marks every significant romantic event. Mazibuko, the director, is a musician first and has previously written a gospel show. In the play, she sings along with the previous-helpers in the chorus during the bulk of the show. Mazibuko is also the writer and she says she writes from the heart. Her sweeping romantic marathon shows this. It is all mush. The work does, however, reveal a burgeoning director with potential. “This year, it’s my first time writing and directing,” she says. She will need more mentorship to be able to focus the story to its key aspects as she claims she cannot cut anything more from the too-long work. She will also need guidance to help her hone some of her more interesting ideas. Working from the heart, she stages a moment referencing the Titanic, with Thabo and Anelisa standing on a chair for a balcony, arms outstretched to the tune of ‘My Heart Will Go On’ being whistled in the background. Absolute sop. Yet, while venturing into the extremely cheesy at times, Mazibuko also creates some imaginatively exciting images. During a fight scene in which Anelisa kicks Thabo out her flat, they both stand back to back against the board used for her door. The pair holds up the board with their backs, and changing positions to sit and then get back up to speak directly to each other through the door, keeping it held between them by their proximity. The fledgling director creates multiple images of up-close tension through the use of simple devices. The images fail where they become direct references from films of the romance genre, and the wonder of the romance is delineated far too much by the oversentimental nature of the music. The work borders too far into melodrama. But, the genre is held by well-crafted performances and a use of objects that turns four chairs, some cardboard, and household goods into multiple tools to create a believable world out of almost nothing. “We didn’t have things like props and things,” Mazibuko says. It is not a new theme in South African theatre. “Besihlupheka so seza necreativity of ukuthi okay, ‘let’s use these chairs’. Ukuhlupheka kusenza kuvuleke icreativity.” And, without any sentimentality for the lack of funds to create the work she wanted, she relishes the opportunity use here creativity to create her vision without set or any other props at her disposal. And, while the work itself was awarded last place from the final four plays at the Zwakala Festival, and while the work she creates may only serve a particular section of the theatre community, here is a director being born. Ibala is definitely not a play that one can imagine being given a run at the Market Theatre. Mazibuko herself, cannot even begin to imagine how she would create with actual funds. A travesty. But, here is a creative eye. The Critter’s coverage of the Zwakala Festival was sponsored by The Market Theatre Foundation.